File photo: LAPD Chief Charlie Beck. The measure on the May 16 Los Angeles city ballot that would change the LAPD's discipline process has upended the usual political dynamics around the issue: The officers' union is advocating for an increased civilian role in police oversight, while Black Lives Matter has joined Chief Charlie Beck in expressing skepticism about the idea. Measure C would give officers facing firing or other major discipline the option of requesting that the board of rights that hears their case be comprised of three civilians, rather than the current makeup of two LAPD command officers and one civilian. If the chief wants to suspend an officer for more than 22 days, or fire him, the board of rights takes the case. It decides whether the officer is guilty, and if so, it rules on the disciplinary action. The chief can reduce the discipline but not increase it. Officers can end up before the board of rights for anything from excessive use of force or lying on reports to off-duty behavior such as domestic violence or a DUI. The Los Angeles Police Protective League, which represents nearly 10,000 LAPD officers, successfully lobbied the city council and Mayor Eric Garcetti to place Measure C before the voters. The union argues that the members of the chief's command staff don’t treat the accused fairly because the chief pressures them to go along with his decisions. "It can't be a rigged system"
"The officer should feel that they are going to get a fair shake," said Police Protective League President Craig Lally. "It can’t be a rigged system where there is a predisposed guilty finding before the evidence is heard." All-civilian panels would be more independent of the chief – and more fair, he said. The Police Commission selects the civilians who serve on the rotating panels. They must have arbitration experience; most of the 38 civilians are lawyers. City ethics rules prohibit Chief Beck from taking a stance on Measure C, but he pointed to a city study that found discipline boards already act independently. "Over half the time, the command staff doesn’t go along with exactly what I recommend," Beck said. "So if I’m influencing them, I’m not doing a very good job of it." A study by the city’s Chief Legislative Analyst found these panels rejected Beck’s requests to fire officers in the majority of the 229 termination cases heard since 2011. Some command officers have accused Beck of retaliating when they rejected his recommendations. Four captains who served on these boards filed lawsuits accusing Beck of not promoting them because they voted against firing an officer. He denied their allegations. A jury rejected one of the suits in April 2016 and another case was settled last August. A "wolf in civilian oversight's clothing"? The legislative analyst's study also found that when the board of rights found an officer not guilty of misconduct, the civilian member always voted to acquit. 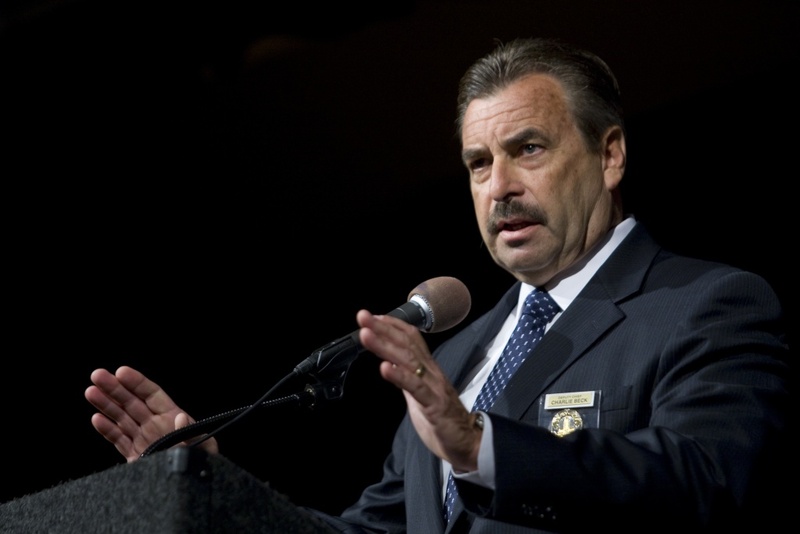 "The civilian members generally tend to recommend lighter discipline than the command officers," said retired LAPD Captain Greg Meyer, who sat on dozens of discipline boards during his career. He speculated that because command officers are better versed in what cops should and should not do under LAPD policies, they have less tolerance for any misbehavior. Concerned that all-civilian panels would be too soft on misbehaving cops, the American Civil Liberties Union of Southern California, civil rights attorney Connie Rice and Black Lives Matter leader Melina Abdullah have all lined up against Measure C.
"Charter Amendment C is the wolf in civilian oversight's clothing," said Abdullah. "I think it’ s really about a mayor who has ambitions to seek higher office doing a favor for the police union." Mayor Garcetti has insisted he backs the measure because it would increase civilian oversight of discipline matters. City Council President Herb Wesson, who led the council’s effort to place it on the ballot, makes the same argument. But opponents counter that using only the lawyers in the civilian pool would result in less discipline, given their propensity to back officers. Some activists who have consistently criticized Beck in the past are in agreement with him on Measure C.
"It feels odd for us to be on the same side as Chief Beck in this fight," said Pete White of Skid Row-based L.A. Community Action Network. "But this fight right now is a hold-the-line fight," he said. "We don’t want to make things worse with civilian panels that are more lenient on cops." The city created the board of rights panels in the 1930s in an attempt to counter the systemic corruption within the LAPD under the leadership of Chief James E. Davis. The department collected taxes from prostitution and gambling rings, and cops who refused to participate could get fired. Three members of the LAPD command staff comprised the panels. They would review the chief’s terminations to determine if they were fair – or merely punishment for failing to go along with the corruption. In the wake of the 1992 riots, L.A. city voters approved a set of reforms in 1995 that included replacing one of the commanders who sit on the panels with a civilian. The idea was to improve civilian oversight. At the time, the police union opposed the idea, arguing that a civilian couldn't understand policing and fairly judge officers accused of misconduct. Click on the play button above to hear Frank Stoltze's conversation with Alex Cohen on Morning Edition about Measure C.